One of the reasons missile defense has always been a controversial idea is that it is impossible to know how well the defense would perform if it is ever used in the context of a nuclear attack. This fundamental uncertainty creates a situation in which you could get away with almost any statement about missile defense. If you are in the business of building up your nuclear forces, you could easily argue that you need more warheads to penetrate defenses. On the other hand, if you are in the missile defense business, you could always say that your system will provide adequate protection against the missile threat of the day. These kind of arguments always worked well during the cold war and are still working today - on both sides of the debate. The Soviet missile defense program provides a very interesting and important data point in this discussion. We have some idea of what the United States thought it needed to defeat the Soviet system. 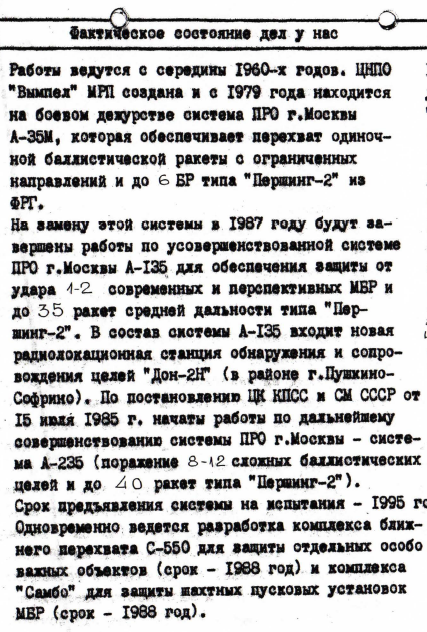 Thanks to the Katayev archive, we now have the numbers that describe Soviet estimates of the performance of the Moscow ABM system. One document in the archive, reproduced here and translated below, contains a brief description of the program as it stood in 1985. Other documents in the archive provide some useful context. As the Soviet documents clearly show, the system was never expected to offer anything but a very modest intercept capability - the currently deployed A-135 system was expected to intercept no more than 1-2 ballistic missiles. The document is a bit vague on the definition of a ballistic missile in this case, but it does not seem to mean 1-2 MX-type ICBMs with 10 warheads each - it is more like 1-2 "complex ballistic targets", each of them being a single warhead surrounded by decoys and penetration aids. I guess that given that Moscow was expected to be quite densely targeted some of these "complex ballistic targets" could include a few warheads (here is where nuclear intercept would come handy). The capability provided by the A-135 predecessor, A-35, was even more modest - "a single ballistic missile from some directions." Here "single" probably meant just a single warhead. These numbers are of course particularly interesting when compared with the number of warheads that were dedicated to defeating the Moscow ABM. In their Protection Paradox paper Hans Kristensen, Matthew McKinzie, and Stan Norris estimated that in 1968 the U.S. war plan assigned 66 warheads to suppression of the A-35 system - that was, by the way, more than ten years before the system became operational. They also estimated that in 1989 the United States allocated about 200 warheads to defeat the Moscow ABM. And, of course, the United Kingdom and France argued that they needed hundreds of warheads and sophisticated decoys if their ballistic missiles are to penetrate the defense around Moscow. It is tempting to conclude that the extent of the overkill demonstrates the relationship between offense and defense - that deployment of defenses only prompts an overwhelming offensive response. There is some truth to that, of course, but my guess is that the reality was a bit different - the United States had so many warheads, there were not enough targets for them. Spending a hundred or so warheads on suppressing missile defense seemed like a reasonable thing to do and nobody particularly cared about the capability that defense was actually able to provide. The memo is undated, but by all indicators it was prepared in the late 1985 - most likely ahead of the first Reagan-Gorbachev summit in Geneva in November 1985. The work [on missile defense] has began in the mid-1960s. The TsNPO Vympel of the MRP [Ministry of Radio Industry] has developed the A-35M Moscow ABM system that has been on combat duty since 1979. The system provides a capability to intercept a single ballistic missile from some directions and up to 6 Pershing 2-type missiles from the FRG. The work on a replacement system, an improved A-135 Moscow ABM system, will be completed in 1987 to provide protection from a strike of 1-2 modern and prospective ICBMs and up to 35 Pershing 2-type intermediate-range missiles. The A-135 system includes a new acquisition and tracking radar, Don-2N (near Pushkino-Sofrino). In accordance with the Decision of the Central Comittee and the Council of Ministers of 15 July 1985, the work has began on further modification of the Moscow ABM system - the A-235 system (intercept of 8-12 complex ballistic targets and up to 40 Pershing-2-type missiles). The system will be presented for tests in 1995. At the same time, development is under way of a short-range intercept system S-550 for protection of single highly valuable objects (timeline -1988) and of a 'Sambo' system for protection of ICBM silo launchers (timeline - 1988). All development is carried out in compliance with the ABM Treaty, with the exception of the S-550 and 'Sambo' systems, whose deployment would be inconsistent with the Treaty. Most of the work on the A-135 system was completed in time, but the tests of the system (or, rather, of its test prototype, known as Amur), conducted at the Sary-Shagan from March to October 1987, showed that it needs some serious work. The Ministry of Defense did not accepted the system for service and returned it to the industry. The next series of tests was conducted in 1989 and A-135 was accepted for "pilot joint operations" in 1990 ("joint" here means that industry representatives were operating the system together with the military). It did not begin combat duty until 1995. The A-235 system was not an entirely new project - the work on system began in 1975. 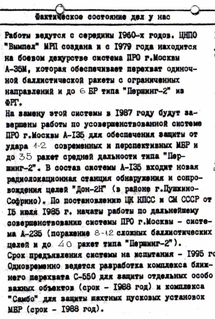 The plan that was approved in 1978 assumed that A-235 will provide defense of Moscow and "the Mosow industrial region" and will be followed by an even larger system - A-1035 - that would extend protection of "key administration and military centers". It appears that the A-235 project has been revived recently. It is unlikely, though, that the design goals - protection of the Moscow region and intercept of 1-2 missiles - have changed significantly. There is not much information about S-550 and Sambo. As far as I can tell, S-550 was a terminal defense system with a traditional fast interceptor that would protect key command and control facilities as well as Moscow. It was probably based on the work that was done in the S-225 terminal missile defense project, which was closed in 1984 - it appears that the missile was transferred to the A-135 system (a discussion of that transfer on this blog). The 5K17 radar of the system - known as Flat Twin in the U.S. - had been moved to Kamchatka (it has been dismantled some time after 2005). The S-550 project was still active around 1989, but by all indications the work had stopped after 1991. Sambo has been mentioned in a few documents as an "active defense of missile silos and command facilities." It appears that it was based on the idea of shooting a lot of metal rods at the incoming warhead causing it to detonate prematurely. Something like that has been discussed in the United States as well in the context of providing defense of MX silos. The 1985 plan called for the Sambo system to be completed in 1987 and for tests too begin in 1989. However, in 1986 this name disappeared from documents and has never been mentioned again. Sambo was apparently replaced by another "active" silo protection system - "Mozyr", although it is not clear if Mozyr used metal rods as well or relied on some other mechanism (in Katayev's notes from the early 1980s, Sambo is mentioned together with another active system, "Aktiv", which was supposed to use explosives to protect the silo). There is some information that the development of Mozyr involved an intercept of a warhead in a flight test conducted in the late 1980s. MilitaryRussia.ru has some interesting photos of what appears to be a Mozyr test facility in Kamchatka. Now that the Russian government believes it needs to spend some serious money on modernization of its strategic forces, the Moscow ABM system is clearly getting an overhaul. Russia conducts regular tests of short-range interceptors of the system and appears to be working on new version of the interceptor missile. The word is that a new missile will replace the long-range interceptors that were removed from service some time around 2006. There were reports about modernization of the Don-2N radar. Some ongoing programs are hidden behind obscure names, like "Samolyot-M" (here is a very interesting overview of some of these programs prepared by Aleksandr Stukalin). I should note that although the system is known to rely on nuclear interceptors, all the available evidence suggests that nuclear warheads are removed from interceptor missiles are stored in a (presumably) safe location. There have been reports about conventional intercept capability, but it is unlikely that this can be achieved without a complete redesign of the system. Moreover, the Russian designers and the military are extremely skeptical about a possibility of building a reliable non-nuclear missile defense (in fact, they fully expect that the United States will convert its system to nuclear interceptors at some point having figured out that hit-to-kill doesn't quite work). Wasn't the Moscow ABM system designed for a nuclear explosion in the atmosphere that would somehow destroy the target? It was not a kinetic hit-to-kill system, right? So the existing interceptors probably do not have that capability. On the other hand, in the 1990s, there was a decision to remove the nuclear component from them. Which raises the question: what would the new, redesigned system be? David: I very much doubt the system could do a conventional intercept. Definitely not hit-to-kill. As I mentioned, it would require a quite thorough redesign of the system - not just interceptors, but the radar and the software as well. There was a tender issued this year for the demolition of the non-functioning sector of the Dunay-3U radar. The documents say the the demolition is connected to (and needs to be co-ordinated with) the installation of 14Ts031 on the same site - which seems to be missile defence related. V-1000 (precursor to System A) was designed and successfully tested with directional blast fragmentation. A-135 is nuclear only, but based on the 60's tests, conventional interceptors are not outside of Soviet/Russian technical expertise. There is zero evidence that current system is going to lose nuclear warheads. SL: It looks like 14Ts031 is a radar that will support the new long-range interceptors. The entire system appears to be known as 14Ts033. The limitation A-135 system to intercept 1-2 modern and prospective ICBMs in background of decoys etc i feel was more of limitation of 80's Signal Processing , Long Range Tracking of Radar and Guidance of interceptor to its kill box using tradational Command Guidance technique. Now with the availability of COTS and exponential growth in Signal Processing , Energy Effecient AESA T/R module ( over tradational power hungry PESA that needs a cooling system of its own ) and independent guidance using IIR seeker or RF seeker the ability of A-235 or some other system to intercept multiple ICBM type target involving tens of targets against background of decoys/jammers is quite feseable. What would be difficult to intercept is a RV that can change altitude and manouver in space using microthrusters surrounded by decoys/jammers and in atmosphere using scramjet engine that can power these RV and let them manouver in range and altitude without loosing much speed would be tough for any present ABM system from US or Russian stable that uses traditional means like radar to track and guide its target. There is also this great potential of plasma generated by intense heat on this manouvering RV blocking it being spotted by Radar systems from Ground. All in All even if ABM systems can improve in many areas using modern technology it would really require High Energy systems to take out such RV rather then tradational interceptors.